Here you can find most of my work – click on the links for direct access! Büscher, Bram and Robert Fletcher (2020, in press). The Conservation Revolution. Radical ideas for Saving Nature beyond the Anthropocene. London: Verso. Büscher, Bram (2013). Transforming the Frontier. Peace Parks and the Politics of Neoliberal Conservation in Southern Africa. Durham: Duke University Press. → Click here or on the cover to read more about the book! Fletcher, R. and B. Büscher (2018). Political Ecologies of Green Wars. Special issue, Conservation and Society: 16, 2: 105-192. Büscher, Bram, ed. (2017). Nature 2.0: New Media, Online Activism and the Cyberpolitics of Environmental Conservation. Geoforum, special issue – volume 79. Büsc her, Bram, Wolfram Dressler and Robert Fletcher (2014). Nature™ Inc: Environmental Conservation in the Neoliberal Age. Tuscon: University of Arizona Press. Büscher, Bram and Veronica Davidov (2013). The Ecotourism – Extraction Nexus: Political Economies and Rural Realities of (un)Comfortable Bedfellows. London: Routledge. Arsel, Murat and Bram Büscher (2012). Forum 2012, with a Debate section on ‘Nature™ Inc: Changes and continuities in neoliberal conservation and market-based environmental policy’. Development & Change 43, 1: 1-448. Büscher, Bram and Murat Arsel (2012). Neoliberal Conservation and Uneven Geographical Development. Exploring the changing nature of capitalist modernity in Nature-Society interactions. Special feature of Journal of Economic and Social Geography 103, 2: 129-195. Magole, Lapologang, Stephen Turner and Bram Büscher (2010). Cross Commons Governance in Southern Africa. Special feature of International Journal of the Commons 4, 2: 602-682. Büscher, Bram, Conrad Steenkamp and William Wolmer (2007). The politics of engagement between biodiversity conservation and the social sciences. Special section of Conservation and Society 5, 1: 1-114. Oommen, M. R. Cooney, M. Ramesh, M. Archer, D. Brockington, B. Büscher, R. Fletcher, A. Vanak, G. Webb and K. Shanker (2019, in press). Fiddling while Rome burns: the fallacy of compassionate conservation. Conservation Biology. Duffy, R., F. Massé, E. Smidt, E. Marijnen, B. Büscher, J. Verweijen, M. Ramutsindela, T. Simlai, L. Joanny and E. Lunstrum (2019, forthcoming). Why we must question the Militarisation of conservation. Biological Conservation. Büscher, Bram (2019). From ‘Global’ to ‘Revolutionary’ Development? Development and Change 50, 2: 484-494. Ramutsindela, M. and B. Büscher (2019, in press). Environmental Governance and the Making of the African State. In: N. Cheeseman (ed.). Oxford Encyclopaedia of African Politics. Oxford: Oxford University Press. Koot, Stasja and Bram Büscher (2019, in press). Giving land (back)? Indigeneity and the meaning of land in the ontological politics of the South Kalahari Bushmen land claim in South Africa. Journal of Southern African Studies. Fletcher, Robert, Wolfram Dressler, Zachary Anderson and Bram Büscher (2019, in press). Natural Capital Must Be Defended: Green Growth as Neoliberal Biopolitics. Journal of Peasant Studies. Wainwright, J. and B. Büscher (2019, in press). From a New Deal to Projekt Deal: Time for solidarity with German scholars. Geoforum. Fletcher, Robert and Bram Büscher (2019). Neoliberalism in Denial in Actor-Oriented PES Research? A Rejoinder to Van Hecken et al. and a Call for Justice. Ecological Economics 156: 420-423. Brockington, D. W.M. Adams, B. Agarwal, A. Agrawal, B. Büscher, A. Chhatre, R. Duffy, R. Fletcher, J.A. Oldekop (2018). Working Governance for Working Land. Science 362, 6420: 1257. Büscher, Bram and Robert Fletcher (2018). Under Pressure: conceptualising Political ecologies of “Green Wars”. Conservation and Society 16, 2: 105-113. Büscher, Bram (2018). From Biopower to Ontopower? Violent Responses to Wildlife Crime and the New Geographies of Conservation. Conservation and Society 16, 2: 157-169. Büscher, Bram, Renee van den Breemer, Robert Fletcher and Stasja Koot (2017). Contradictions of the ‘Ecotourism Script’: Global Marketing and Local Politics in Ghana. Critical Arts 31, 4: 37-52. Fletcher, Robert, Wolfram Dressler, Zach Anderson and Bram Büscher (2017). Debating REDD+ and its implications. Reply to Angelsen et al. Conservation Biology 31, 3: 721-723 (For Angelsen et al piece, see here). Büscher, Bram, Robert Fletcher, Dan Brockington, Chris Sandbrook, William Adams, Lisa Campbell, Catherine Corson, Wolfram Dressler, Rosaleen Duffy, Noella Gray, George Holmes, Alice Kelly, Elisabeth Lunstrum, Maano Ramutsindela, Kartik Shanker (2017). Doing Whole Earth Justice: reply to Cafaro et al. Oryx 51, 3: 401. (for the Cafaro et al piece, see here). Büscher, Bram, Robert Fletcher, Dan Brockington, Chris Sandbrook, William Adams, Lisa Campbell, Catherine Corson, Wolfram Dressler, Rosaleen Duffy, Noella Gray, George Holmes, Alice Kelly, Elisabeth Lunstrum, Maano Ramutsindela, Kartik Shanker (2017). Half-Earth or Whole Earth? Radical ideas for conservation and their implications. Oryx 51, 3: 407-410. Büscher, Bram, Stasja Koot and Ingrid Nelson (2017). Introduction. Nature 2.0: Social Media, Online Activism and the Cyberpolitics of Environmental Conservation. Geoforum 79: 111-113. Büscher, Bram (2017). Conservation and development 2.0: intensifications and disjunctures in the politics of online ‘do-good’ platforms. Geoforum 79: 163-173. Büscher, Bram and Robert Fletcher (2017). Destructive Creation: Capital, Value and the Structural Violence of Tourism. Journal of Sustainable Tourism 25, 5: 651-667. Fletcher, Robert and Bram Büscher (2017). The PES conceit. Revisiting the Relationship between Payments for Environmental Services and Neoliberal Conservation. Ecological Economics 132: 224-231. Büscher, Bram and Veronica Davidov (2016). Environmentally-induced Displacements in the Ecotourism-Extraction Nexus. Area 48, 2: 161-167. Fletcher, Robert, Wolfram Dressler, Bram Büscher and Zach Anderson (2016). Questioning REDD+ and the Future of Market-Based Conservation. Conservation Biology 30, 3: 673-675. Büscher, Bram (2016). Nature 2.0: Exploring and Theorizing the links between New Media and Nature Conservation. New Media & Society 18, 5: 726-743. Büscher, Bram (2016). “Rhino poaching is out of control!” Violence, Race and the Politics of Hysteria in online Conservation. Environment and Planning A 48, 5: 979-998. Duffy, R., F. St John, B. Büscher and D. Brockington (2016). Towards a new understanding of the links between poverty and illegal wildlife hunting. Conservation Biology 30, 1: 14-22. Büscher, Bram and Maano Ramutsindela (2016). Green Violence: Rhino Poaching and the War to Save Southern Africa’s Peace Parks. African Affairs 115, 458: 1-22. Büscher, Bram (2016). Reassessing Fortress Conservation: New Media and the Politics of Distinction in Kruger National Park. Annals of the Association of American Geographers 106, 1: 114-129. Büscher, B., W. Dressler and R. Fletcher (2015). Nature™ Inc Redux: towards a dialectic of logics and excess. Environment and Planning A 47, 11: 2404-2408. Duffy, R., F. St John, B. Büscher and D. Brockington (2015). The Militarization of Anti-Poaching: Undermining Long Term Goals. Environmental Conservation 42, 4: 345-348. Büscher, Bram (2015). Investing in Irony? Development, Improvement and Dispossession in Southern African Coal Spaces. European Journal of Development Research 27, 5: 727-744. Büscher, Bram (2015). The Ironies of Progress and Plunder: a Review of the Africa Progress Report 2014. Development and Change 46, 4: 949-960. Fletcher, R., Dressler, W. and B. Büscher (2015). Nature™ Inc: Nature as capitalist Imaginary. In: R. Bryant (ed.). Handbook of Political Ecology. Cheltenham, UK: Edward Elgar, pp. 359-372. Büscher, Bram (2015). The political economy of Africa’s natural resources and the ‘Great Financial Crisis,’ TEMTI Series of Economic Perspectives on Global Sustainability, EP 02-2014, TEMTI–CEESP / IUCN. Reprint of 2012 article in Journal of Economic and Social Geography. Büscher, Bram and Robert Fletcher (2015). Accumulation by Conservation. New Political Economy 20, 2: 273-298. Castree, N., W. Adams, J. Barry, D. Brockington, B. Büscher, E. Corbera Elizade, D. Demeritt, R. Duffy, U. Felt, K. Neves, P. Newell, L. Pellizzoni, K. Rigby, P. Robbins, L. Robin, D. B. Rose, A. Ross, D. Schlosberg, S. Sörlin, P. West, M. Whitehead and B. Wynne (2014). Challenging the Intellectual Climate. Nature Climate Change 4, 9: 763-768. Büscher, Bram (2014). Collaborative Event Ethnography: between Structural Power and Empirical Nuance? Global Environmental Politics 14, 3: 133-139. Büscher, Bram (2014). Selling Success: Constructing Value in Conservation and Development. World Development, 57: 79-90. Dressler, W., B. Büscher, R. Fletcher (2014). Conclusion: the Limits of Nature™ Inc. and the Search for Vital Alternatives. In: B. Büscher, W. Dressler and R. Fletcher (eds). Nature™ Inc: New Frontiers of Environmental Conservation in the Neoliberal Age. Tuscon: University of Arizona Press, pp. 246-253. Fletcher, R., W. Dressler and B. Büscher (2014). Introduction. Nature™ Inc: The New Frontiers of Environmental Conservation. In: B. Büscher, W. Dressler and R. Fletcher (eds). Nature™ Inc: New Frontiers of Environmental Conservation in the Neoliberal Age. Tuscon: University of Arizona Press, pp. 3-21. Sullivan, Sian, Jim Igoe and Bram Büscher (2013). introducing Nature on the Move – a Triptych. New Proposals: Journal of Marxism and Interdisciplinary Inquiry 6, 1/2: 15-19. Büscher, Bram (2013). Nature on the Move: The Value and Circulation of Liquid Nature and the Emergence of Fictitious Conservation. New Proposals: Journal of Marxism and Interdisciplinary Inquiry 6, 1/2: 20-36. Sandbrook, Chris, William M. Adams, Bram Büscher and Bhaskar Vira (2013). Social Research and Biodiversity Conservation. Conservation Biology 27, 6: 1487-1490. Büscher, Bram (2013). Biodiversity. In: C. Death (ed.). Critical Environmental Politics. London: Routledge, pp. 13-21. Büscher, Bram and Veronica Davidov (2013). Conceptualising lived experiences within the political economy of the Ecotourism-Extraction Nexus. In: B. Büscher and V. Davidov (eds.). The Ecotourism – Extraction Nexus: Political Economies and Rural Realities of (un)Comfortable Bedfellows. London: Routledge, pp.17-34. Davidov, Veronica and Bram Büscher (2013). Introduction: the Ecotourism-Extraction Nexus. In: B. Büscher and V. Davidov (eds.). 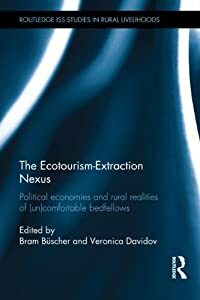 The Ecotourism – Extraction Nexus: Political Economies and Rural Realities of (un)Comfortable Bedfellows. London: Routledge. pp. 1-16. Büscher, Bram, Sian Sullivan, Katja Neves, Jim Igoe and Dan Brockington (2012). Towards a Synthesized Critique of Neoliberal Biodiversity Conservation. Capitalism Nature Socialism 23, 2: 4-30. Büscher, Bram and Wolfram Dressler (2012). Commodity Conservation. The restructuring of community conservation in South Africa and the Philippines. Geoforum 43, 3: 367-376. Büscher, Bram and Murat Arsel (2012). Introduction: neoliberal conservation, uneven geographical development and the dynamics of contemporary capitalism. Journal of Economic and Social Geography 103, 2: 129-135. Büscher, Bram (2012). The Political Economy of Africa’s Natural Resources and the ‘Great Financial Crisis’. Journal of Economic and Social Geography 103, 2: 136-149. Arsel, Murat and Bram Büscher (2012). Nature™ Inc: Changes and continuities in neoliberal conservation and market-based environmental policy. Development & Change 43, 1: 53-78. Büscher, Bram (2012). Payments for Ecosystem Services as Neoliberal Conservation: (reinterpreting) Evidence from the Maloti-Drakensberg, South Africa. Conservation and Society 10, 1: 29-41. Büscher, Bram (2011). The Neoliberalisation of Nature in Africa. In: Ton Dietz, Kjell Havnevik, Mayke Kaag & Terje Ostigard (eds.). New Topographies of Power? Africa Negotiating an Emerging Multi-polar World. Leiden: Brill, pp. 84-109. Büscher, Bram and Elna de Beer (2011). The Contemporary Paradox of Long-term Planning for Social-Ecological Change and its Effects on the Discourse-Practice Divide: Evidence from Southern Africa. Journal of Environmental Planning and Management 54, 3: 301-318. Wittmayer, Julia and Bram Büscher (2010). Conserving conflict? Transfrontier conservation, development discourses and conflict between South Africa and Lesotho. Human Ecology 38, 6: 763-773. Magole, Lapologang, Stephen Turner and Bram Büscher (2010). Introduction: Towards an Effective Commons Governance System in Southern Africa? International Journal of the Commons 4, 2: 602-620. Dressler, Wolfram, Bram Büscher, Michael Schoon, Dan Brockington, Tanya Hayes, Christian Kull, James McCarthy and Krishna Streshta (2010). From Hope to Crisis and Back? A Critical History of the Global CBNRM Narrative. Environmental Conservation 37, 1: 5-15. Büscher, Bram (2010). Seeking Telos in the ‘Transfrontier’: Neoliberalism and the Transcending of Community Conservation in Southern Africa. Environment and Planning A 42, 3: 644-660. Büscher, Bram (2010). Derivative Nature: Interrogating the Value of Conservation in ‘Boundless Southern Africa’. Third World Quarterly 31, 2: 259-276. Büscher, Bram (2010) Anti-Politics as Political Strategy: Neoliberalism and Transfrontier Conservation in Southern Africa. Development and Change 41, 1: 29-51. Büscher, Bram and Stacey Büscher-Brown (2010). ‘Conservation’ and ‘Environmental Services’. In N. Cohen (ed.). Green Business. An A-Z guide.London: Sage publishers. Büscher, Bram (2009). Letters of Gold: Enabling Primitive Accumulation through Neoliberal Conservation. Human Geography 2, 3: 91-94. Büscher, Bram (2009). Connecting Political Economies of Energy in South Africa. Energy Policy 37, 10: 3951-3958. Büscher, Bram and Michael Schoon, (2009). Competition over Conservation: Governance, Cooperation and Negotiating Transfrontier Conservation. Journal of International Wildlife Law and Policy 1&2: 33-59. Büscher, Bram and Elna de Beer (2008). The Paradox of Long-term Planning for Social-Ecological Change. Effects of the Discourse-Practice Divide in Southern Africa. Ökologisches Wirtschaften 2: 27-29. Büscher, Bram (2008). Development between Nuance and Neoliberalism. Focaal. European Journal of Anthropology 51: 161-68. Büscher, Bram (2008). Conservation, Neoliberalism and Social Science: a Critical Reflection on the SCB 2007 Annual Meeting, South Africa. Conservation Biology 22, 2: 229-231. Dressler, Wolfram and Bram Büscher (2008). Market Triumphalism and the so-called CBNRM ‘crisis’ at the South African Section of the Great Limpopo Transfrontier Park. Geoforum 39, 1: 452-465. Büscher, Bram and Wolfram Dressler (2007).Linking Neoprotectionism and Environmental Governance: on the Rapidly Increasing Tensions Between Actors in the Environment-Development Nexus. Conservation and Society 5, 4: 586-611. Büscher, Bram and Tendayi Mutimukuru (2007). Buzzing too far? The Ideological Echo of the Global Governance Agenda on the Local Level: The case of the Mafungautsi Forest in Zimbabwe. Development Southern Africa 24, 5: 649-664. Büscher, Bram and Webster Whande (2007). Whims of the Winds of Time? Contestations in Biodiversity Conservation and Protected Areas Management. Conservation and Society 5, 1: 22-43. Büscher, Bram and William Wolmer (2007). Introduction. 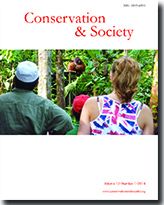 The politics of Engagement between Biodiversity Conservation and the Social Sciences. Conservation & Society 5, 1: 1-21. Atkinson, Doreen and Bram Büscher (2006). Municipal Commonage and Implications for Land Reform: A Profile of Commonage Users in Philippolis, Free State, South Africa. Agrekon 45, 4: 437-466. Büscher, Bram and Ton Dietz (2005). Conjunctions of Governance: the State and the conservation-development nexus in Southern Africa. Journal of Transdisciplinary Environmental Studies 4, 2: 1-15. Van Amerom, Marloes and Bram Büscher (2005). Peace Parks in Southern Africa: Bringers of an African Renaissance? Journal of Modern African Studies 43, 2: 159-182.